her king and her princes. bow their heads to the ground. in the open spaces of the town. no repose for your eyes. at the corner of every street. R. (19b) Lord, forget not the souls of your poor ones. Why, O God, have you cast us off forever? Mount Zion, where you took up your abode. R. Lord, forget not the souls of your poor ones. toward all the damage the enemy has done in the sanctuary. they have set up their tokens of victory. They are like men coming up with axes to a clump of trees. With chisel and hammer they hack at all the paneling of the sanctuary. the place where your name abides they have razed and profaned. for the hiding places in the land and the plains are full of violence. may the afflicted and the poor praise your name. I was in my third year of college, in a creative writing class, when a fellow student shared her story of trauma. Her sobs, her lamentations as she read from her nonfiction piece about her abortion, moved all of us. She shared about an abusive relationship, an uncertain pregnancy, her ultimate decision to abort, and her depression and sadness afterwards. Any true complaints I had about my life vanished right up into thin air, hearing her difficult path. Since then I’ve worked with sexual trauma victims, trafficked persons, and other traumas of the human condition. Each and every story evoked the same feeling of why, God, why? and the same conclusion that suffering is universal and unknowable and raw. Now that I’m no longer practicing as a lawyer, and at home with my little kids, the universe is smaller, more protected, in a way. I feel sheltered from the raw suffering I used to encounter at work. In this world of mothering and mommy-blogging and social media connecting us all, I have witnessed a different kind of suffering: loss of babies, loss of parents, loss of physical abilities. Women suffering infertility, miscarriage, hysterectomies. Families suffering brings again the why, God, why? question to the forefront of my mind. I hear the lamentations from the first reading echo in all of our hearts, we, a long suffering people. But I also take heart at the last line from the Gospel, and all the miracles Jesus wrought for those suffering and dying around Him. 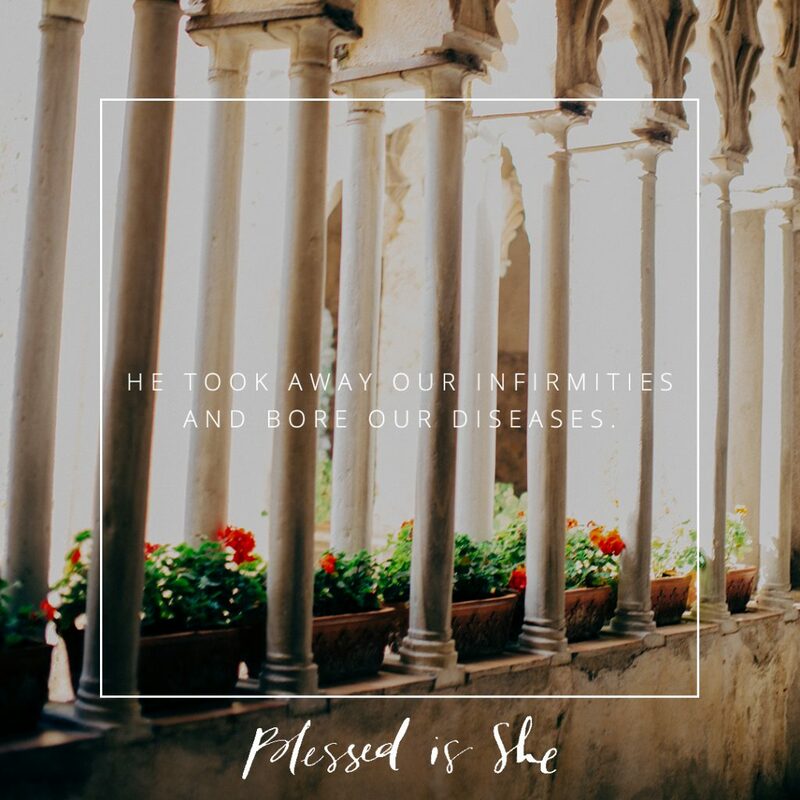 He took away our infirmities and bore our diseases. Come and give our hearts balm, Lord! Christ has conquered death, and in Him, there is no more suffering or loss. We take our faith and hold onto it, even while experiencing and witnessing awful, ugly, terrible, horrible pain around us. Come and give our hearts balm, Lord! Nell O’Leary is an attorney turned stay-at-home mom to three lovelies. She and her husband live in the great city of Saint Paul. You can find out more about her here.